The way we treat jellyfish you would think they were all poisonous or something. For a century or more, there has been a decadal fluctuation in "blooms" of jellyfish numbers (in fact, every 20 years). Recent increases have been fully in line with this trend for all of the species that have been causing havoc to nuclear power station inlets, swimmers and sinking fishing nets with their sheer mass. "Jellyfish" include the stinging medusae, the little-recognised ctenophores, lots of zooplankton and some tunicate animals. 90% of all sets of data about these creatures were gathered from 1874 to the present, although sampling was biased necessarily towards the Atlantic and Mediterranean. Results showed up 1971-85 and 1993-2004 as major blooming periods. You can predict yourself what could follow from those figures! 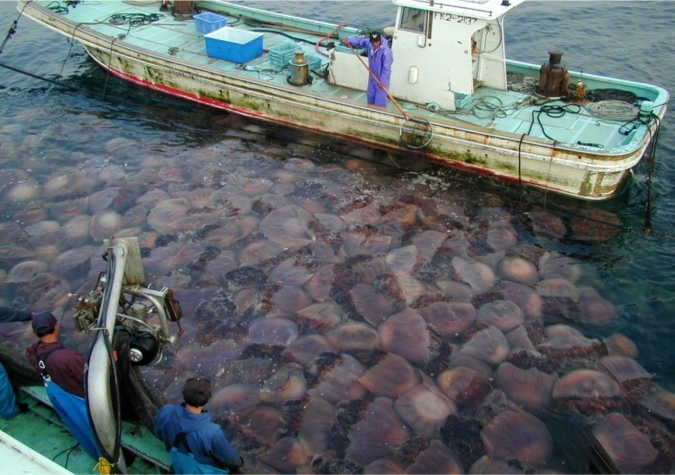 There has indeed been a weak but significant increase in jellyfish generally since 1970. Global warming has to be responsible for some of that, along with vast overfishing of jellyfish's competitors and predators (eg. The mola mola or sunfish and all those turtles that are rapidly becoming extinct) and those hypoxic regions we have created in the oceans. Jellyfish can stand oxygen deficiency so much better than complex animals. There are many more likely effectors of change, such as building many oil and gas-related structures in the ocean that benthic species can attach to. Near the New Moon, species such as box jellyfish drift onto beaches worldwide, trying to attach their miniature and microscopic offspring to reefs and rocks and whatever solid objects they find. Rob Condon of the Dauphin Island Sea Lab in Alabama, and many colleagues around the marine scientific community have published in PNAS this week. They are keen to explore even more data, but basically the evidence has been assembled. David Garrison of the NSF Division of Ocean Sciences in the US funded the research that has, with the Global Jellyfish Group produced the report from Santa Barbara, in California. "It's refreshing to see a thoughtful analysis of the 'jellyfish bloom' phenomenon." Dr. Condon's verdict on this storm in a jello - "The question has been: are jellies playing their natural part or hogging the stage? Based on recent results, they're doing what jellyfish evolved to do, right on cue."